Credit repair can raise your credit score in as little as 30 days. Credit and debt go hand in hand. If you’ve faced challenges with debt, then it’s probably affected your credit, too. In many cases, you need credit repair to correct mistakes and errors in your credit report that you may have picked up along the way while getting out of debt. Just by removing these errors, you can raise your credit score instantly with each successful dispute. There are a few ways to repair your credit and a few things you should know before you get started. Credit repair refers to the process of disputing mistakes and errors in your credit reports. Each credit bureau maintains their own proprietary version of your credit report. They strive to maintain accurate information, but errors can occur. Credit repair is the process you use to correct those errors by submitting a dispute to the credit bureau that issued that report. If the information cannot be verified within 30 days, the credit bureau must remove the item you disputed. Credit reporting started in the 1960s in the tri-state area of Pennsylvania, Delaware and New Jersey. Small local agencies kept profiles on consumers to track their borrowing and debt repayment habits. Local banks used this information to help them during underwriting, to decide if a person should be approved for a new loan. 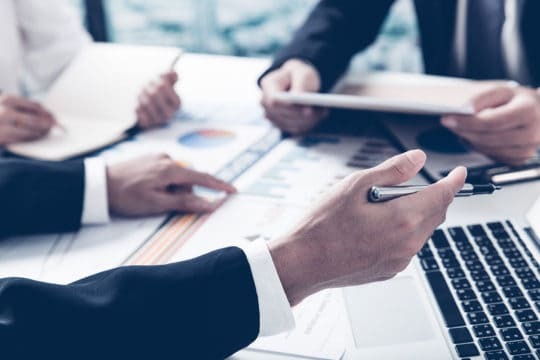 Over the next decade, credit reporting agencies went from localized companies to the nationwide credit reporting agencies we know today. Almost all lenders and creditors go through the three credit bureaus (Experian, Equifax, and TransUnion) to get consumer credit reports. That’s good for consumers because it means they only need to worry about three credit reports. As long as you review those three reports regularly and make sure they’re error-free, you can present the best possible credit profile when someone checks your credit. What does credit repair do? Missed payments that you made on time, which often happens when you arrange a repayment plan with reduced payments. Incorrect account statuses, such as an account saying Settled in Full instead of Paid in Full. Collection accounts that you settled with a pay for delete clause during debt negotiation. Penalties that should have expired, since negative information can only remain on your credit report for a set period. Which of the following types of information is not included in your credit report? Rent payments are not included in your credit reports unless a special allowance is made to include them. In most cases, rent along with utility payments, never appear on your reports. So, a missed rent payment won’t negatively impact your credit. Court judgments, such as unpaid child support, collection accounts and tax liens all appear as public records in your credit report. Credit repair does not give you a way of removing negative information that’s accurate and verifiable. So, this isn’t a magic bullet that can guarantee you a clean credit report with no negative items. If a negative item can be verified by the creditor or lender, then credit repair can’t help you remove it. 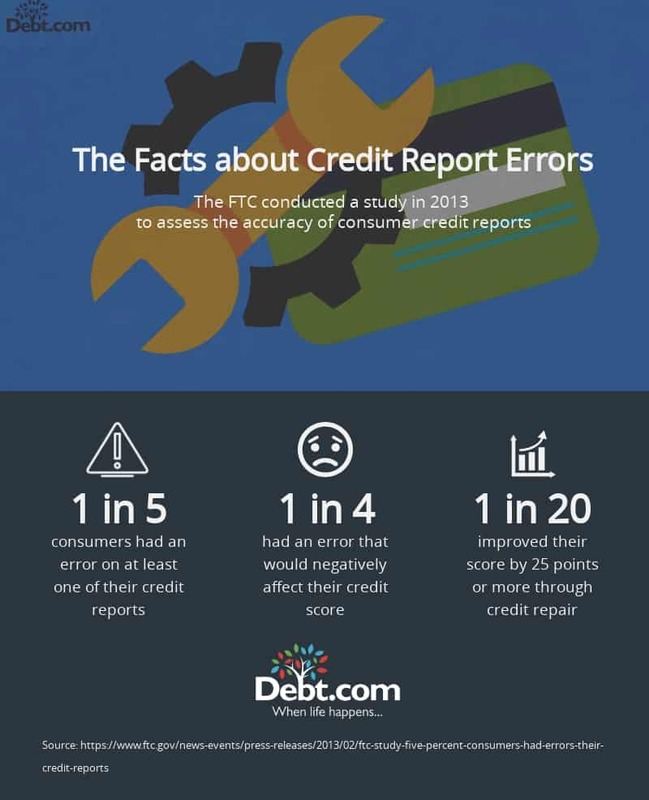 But mistakes and errors happen in credit reporting. In fact, they happen more often than you might think, especially when you face challenges with debt. It’s worth noting here that credit repair is not guaranteed to raise your credit score. First, if there’s nothing to correct in your credit report, then credit repair can’t help you. In addition, credit repair is intended to fix your credit report. Any positive change in your credit score that results is really a happy side effect of correcting your report. But for people who’ve recently face debt problems, the potential credit score boost from credit repair can be huge. It just depends on your unique financial situation. The more mistakes that you need to correct, the more potential it has to boost your credit score. If you have more than few mistakes to correct, it could be worth the money you spend on a professional credit repair service. The money you save through lower interest rates long-term may justify a little money spent now. However, it is possible to repair your credit on your own for free. That’s also part of the rights protected under the Fair Credit Reporting Act. Just be warned that do-it-yourself results can vary, even if you think you know what you’re doing. Still, whether you use the free credit repair process or work with a credit repair company, the steps to repair your credit are basically the same. Review your reports to identify potential errors and mistakes. Dispute any errors you find with the credit bureau that issued the report. Wait 30 days while the credit bureau attempts to verify the information with the credit issuer. If the credit bureau cannot verify the item, it must be removed. The bureau must provide a new copy of your credit report so you can confirm it has the correct information. You can download your credit reports for free once every twelve months. Simply go to annualcreditreport.com to get your free copies each year. Then you review your reports for errors focus on the section that details negative information since those are the items that are hurting your score. Submit your disputes online or through physical mail, making sure to provide documentation that proves your case. It’s important to note that there’s a certain art to do-it-yourself credit repair. So, if you decide to repair your credit on your own, you’re going to need some additional guidance. 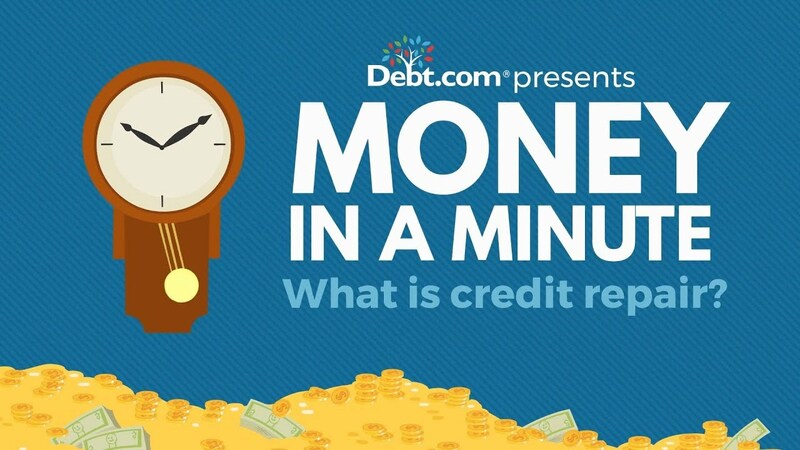 Debt.com provides full instructions and tips on how to repair your credit successfully in our Free Guide for Repairing Your Credit. Although you can repair your credit on your own, we don’t recommend it. If you have the funds to pay a professional credit repair service, you should use one. You’re more likely to get the results you want and it’s going to be far less hassle. So, just like people opt to hire professionals to manage their retirement funds or to buy or sell their home, we recommend you opt for professional credit repair, too. You find a reputable credit repair company with state-licensed attorneys on staff. A company must have an attorney licensed in your state to legally make disputes in your name. Then you authorize said state-licensed attorney to pull your credit reports and make disputes on your behalf. This usually comes with a setup fee of around $15-$20. The credit repair company has their team review your reports and gather the necessary documentation. They make disputes on your behalf and keep you updated on the progress. There is usually a monthly fee that ranges from $80-$120 per month. Once all disputes have been closed, they provide a free copy of your credit report so you can review it. As far as templates go, there are plenty of free credit repair letter templates online. Debt.com offers a free credit repair template letter that you can use if you want to repair your credit on your own. Template letter archives just change a few words based on common situations. But if you aren’t confident about making disputes and how to word the important stuff (which is the stuff you must fill in with any templates), then all the templates in the world won’t help. Top of the line software offers features like autofill templates. But the cost of this software is comparable to the cost of a credit repair service. This is why we recommend going straight for a service if you’re not confident about making disputes yourself. You can try the software, but you may still find yourself unsure about how to proceed. If you’re going to pay for credit repair, it’s best to get it right the first time! That’s why so many scams revolve around consumer debt and credit problems. It’s not just credit repair. There are debt relief scams, debt settlement scams, credit score scams – the list just goes on and on. People are desperate to get out of debt and fix their credit, so they’ll jump at any opportunity presented. The reason that the BBB gives is that they will not rate companies given the number of complaints received from the industry, as a whole. They don’t feel confident giving ratings, so they avoid the credit repair industry altogether. Doesn’t that mean credit repair is bad? No! And it’s bad that consumers think that credit repair is bad because of the scams. A few bad apples make it seem like the credit repair process, as a whole, is fraudulent. But credit repair is a federally protected consumer right. And if you avoid credit repair because you’re worried about scams, you could miss out on the chance to easily boost your score. The solution is not to avoid credit repair entirely, or even to avoid professional credit repair services. You simply need to take extra steps to ensure the service you choose is legitimate. And you can do that even without a BBB rating. Review all company claims and be cautious of absolutes, such as a company guaranteeing that they can improve your credit score by a certain number of points. Most companies offer a free evaluation to answer any questions you have. Use this to your advantage to get a feel for the company and make sure they’re the right fit. If you don’t get a good read, thank them for their time and say you need some time to decide. Then you can continue to research your options and talk to other companies. Don’t make a decision unless you feel comfortable. And don’t worry. As long as you don’t authorize the company to get your credit reports, these initial consultations won’t affect your credit. Want to avoid getting scammed? Debt.com will only match you with legitimate credit repair services that we vet ourselves. The amount of time varies depending on how fast the credit bureaus respond to your disputes. They have 30 days to respond per dispute. If you have multiple disputes to make with more than one bureau, you may decide to handle a few at a time. As a result, the process generally takes about 3-6 months if it’s your first time going through credit repair. The cost varies based which path you take through the credit repair process. If you do it yourself, you can repair your credit for free. Professional credit repair services tend to have setup fees plus monthly administration fees. The setup fee is typically around $15-20 to obtain your credit reports and review them. Then you pay a monthly fee while they make disputes on your behalf. This fee is generally around $80-$120 per month. Credit repair software generally has a one-time cost that ranges from $30-$399. Is credit repair legal in all 50 states? Credit repair is legal under federal law. So, you can legally repair your credit on your own no matter where you live in the United States. Federal law also protects your right to retain legal representation to make disputes on your behalf. This means as long as you retain the services of a state-licensed attorney that you authorize to make disputes on your behalf, then credit repair services are legal, too. Just make sure a credit repair company has at least one attorney on staff that’s licensed to work in your state. Full disclosure: credit repair companies don’t do anything that you can’t do on your own. But they usually do it better than what you can do on your own. Legitimate credit repair companies have state-licensed attorneys and experience making disputes. They know how to make disputes to get results. So, working with a professional repair service often means more mistakes corrected and a bigger boost to your credit score. At Debt.com, it’s our mission to connect you with the services you need, right when you need them. We also want to help you avoid paying for services when you don’t need them to help you save money. So, we’ve developed this year-round credit repair plan to keep your credit profile squeaky clean 365 days a year. If you find errors assess how difficult the disputes will be. Decide if it’s something you can handle on your own. If you have any concerns that you can’t, contact a credit repair company. Take steps to build credit as you correct any errors. Positive actions now can help raise your credit score faster if you still have negative items left after credit repair. Download one of your credit reports again one year later. Check to make sure any disputed items haven’t reappeared and that you don’t have any new issues to dispute. Making sure your credit is mortgage-ready is an essential first step in the home buying process. A few percentage points more in a mortgage interest rate can equal out to thousands over the life your loan. A lower interest rate can also lower your monthly payments. That means it’s in your best interest to make sure your credit is as clean as possible. You should review and repair your credit before you prequalify for a mortgage. Getting approved at the right interest rate on a mortgage isn’t the only reason you should review and repair your credit regularly. We explain the twelve ways that credit repair makes it easier to get the right financing while saving money on everything from utilities to car insurance. Learn all the ways that fixing your credit can help you get to a better place financially.